We first mentioned the Ralph Lauren Art Stars project back in May of this year when the project first launched. The ART STARS project has seen the creation of 42 works from some of Europe’s most recognized up and coming contemporary artists. 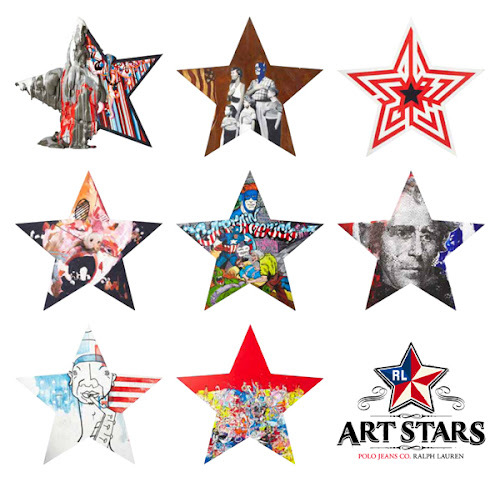 Inspired by iconic Americana synonymous with the brand, the artists created 3D artworks that have been showcased throughout Europe since May and for the first time all the stars have retuned to London for a group show which went on display on Saturday at Phillips de Pury, Howick Place. Since the opening of the London show, visitors have been able to place silent bids on the Art Stars and the event will conclude this evening Monday 6 December with a live auction, in which Simon de Pury will personally auction a selection of the Art Stars. Proceeds from the auction will benefit Teenage Cancer Trust — a charity dedicated to helping young people fight cancer. Yaze, Zosen, ROA, Ripo, Pedro Matos, Pam Glew, Sten and Lex, Ubik, Victor Castillo, Stefan Strumbel, Smash 137, Pio Abad, Okuda, Niklas Holm, Natalie Baker, Morcky Troubles, Microbo, Matt Small, L'atlas, Katrin Fridriks, Kate Moross, Jens Paldam, Jasper Joffe, Jamie Shovlin, James Jessop, Hvass + Hannibal, Herakut, Gilles Balmet, Fupete, Diya Ajit, Delta, Daniele Villa, Daniel Tagno, Case, Bom K, Anton Unai, Antoine Et Manuel, Annie P., Anna Taratiel(OVNI), Alexone, Alex Daw and Alberto De Pedro. The stars will be on display at Phillips de Pury until the 10 December.